Rocky's Fleec at 4 mos. JA Dorado is a beautiful herdsire, with enough color and presence to take over the whole town. He has very heavy substance of bone and his fleece is heavy too! Dorado has great fleece distribution and coverage, head to toe. His crimp and character are excellent! Dorado presents great brightness and good stapling is also evident. His fleece is also very dense! He has large testicles and is very robust. He should be selected when sizing up is a consideration. He is also our most prolific color producer. This is surely passed down from his sire Peruvian Aladdin who is also listed on this page. 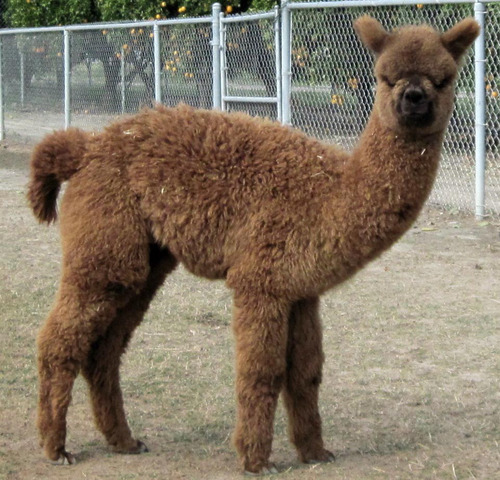 When Victoria was in quarantine in South America, screening animals for importation on behalf of ARI, she learned about solid conformation and fleece traits by screening large groups of alpacas. According to Vic this male has it all. Overall, Dorado is a stunning male that is perfect for dams that can handle higher birth weights or where sizing up and color production are the primary goals. These proven traits are definitely a part of his genetic profile. His father Peruvian Aladdin and his siblings are also great testimonials to the consistency of this bloodline across multiple progeny. She may not have the prettiest face in the herd.. but she makes up for it with her awesome fiber. It is DENSE, DENSE, DENSE! Emma has passed on that density to Liberty, as well as her Multi-Champion son RKA Golden Nugget and all her other offspring! 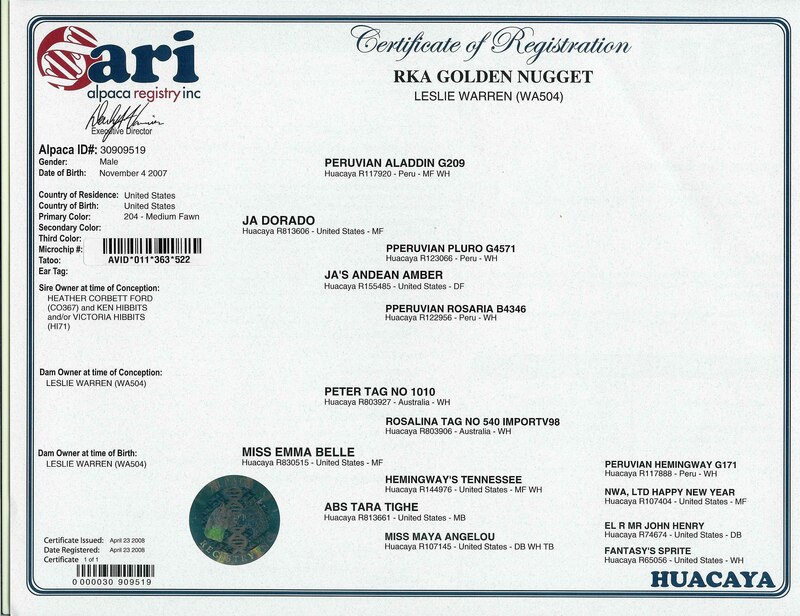 Nugget's lineage includes Peruvian Aladdin and PPeruvian Pluro on his sire's side and Accoyo/Allianza Peter Tag No 1010 (Peter the Great) and Peruvian Hemingway on his dam's side. From his sire JA Dorado and his dam Miss Emma Belle, he has inherited very dense, crimpy fiber, with excellent handle and brightness. His 2010 blanket weighed 7 lbs! He has excellent coverage from his head to his toes. Nugget also has heavy substance of bone, a characteristic of both parents. 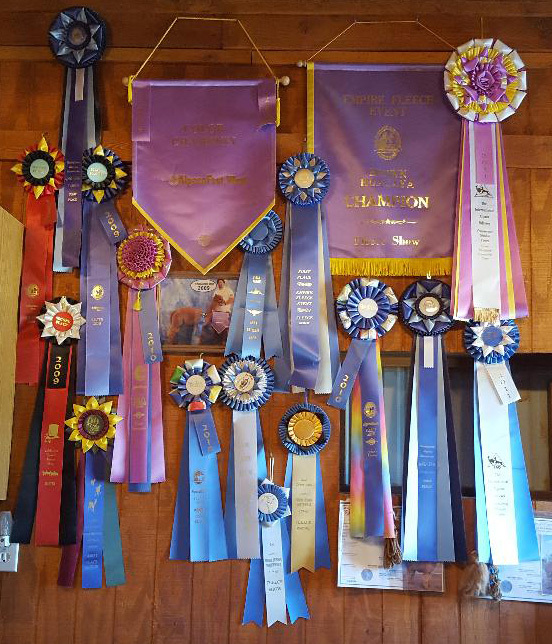 We don't attend many shows, but in those we have entered, Nugget has done very well. His lowest place was second, and he has won three (3) Color Championships, one in halter and one in fleece. In his very first fleece show, Nugget not only took Color Champion in a class of 19, he also took the Judge's Choice Award for the entire show of 109 fleeces!!! We received very nice compliments about his fleece from both the show Superintendent and the Judge, who commented on his score card - "Georgeous Fleece". Nugget's fleece is also holding his fineness. His 2008 histogram had a 18 AFD with a 98.8 Comfort Factor. 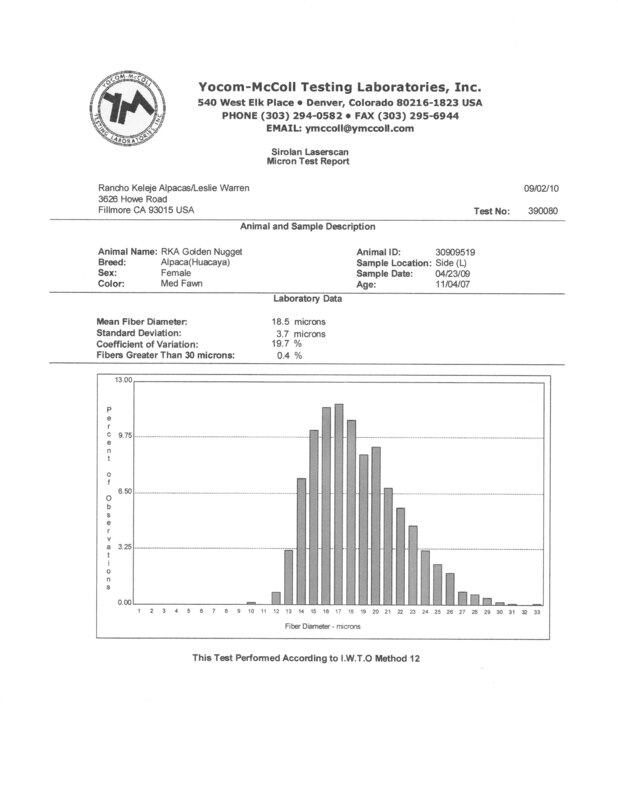 His 2009 histogram had a 18.5 AFD with a 99.6 Comfort Factor. 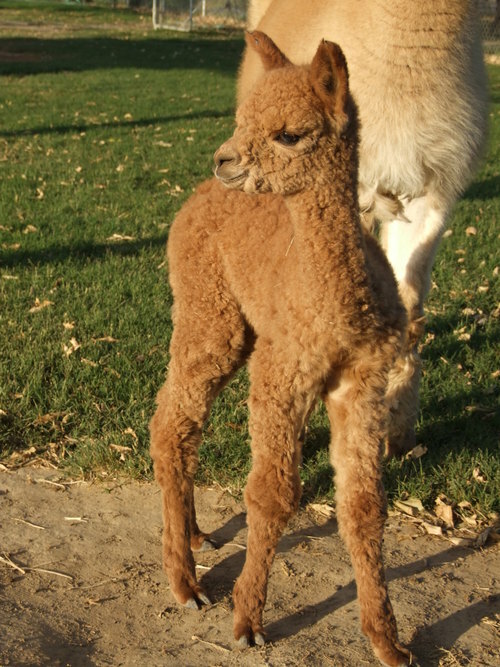 Nugget has started his breeding career and has his first cria on the ground. 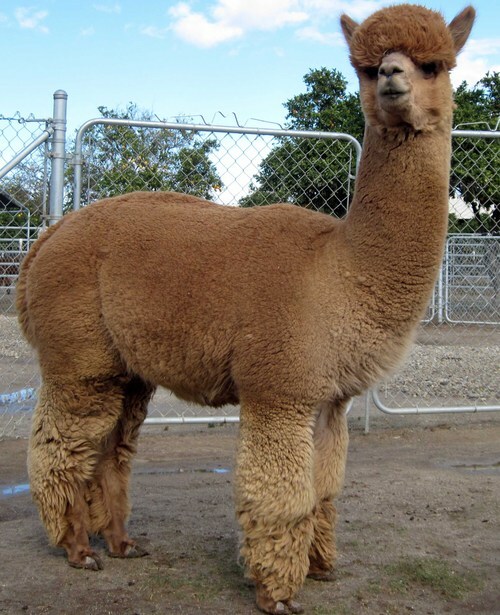 In November 2010, he became the proud father of a beautiful medium brown male cria, out of a medium brown dam. Nugget's "Rocky" has his dad's excellent confirmation, very, very crimpy soft fleece, and he may even exceed the expectations we had for Nugget when he was born. Nugget's first cria is definitely an indication to us that Nugget can pass on his positive traits to his cria. We are already planning on showing Rocky when he is old enough. We are so pleased with the results from his first breeding that we plan to breed several of our unrelated dams to Nugget this Spring. So, there you go...If you want to add density, crimp, coverage and heavy bone in your next crias, consider what Nugget can do for your breeding program. 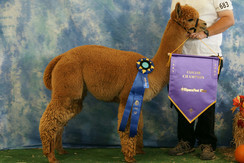 Update 3/21/11: Golden Nugget's fiber just won another Color Championship! This one was for the best Huacaya Fawn Fleece at the International Alpaca Odyssey in Ventura, CA. 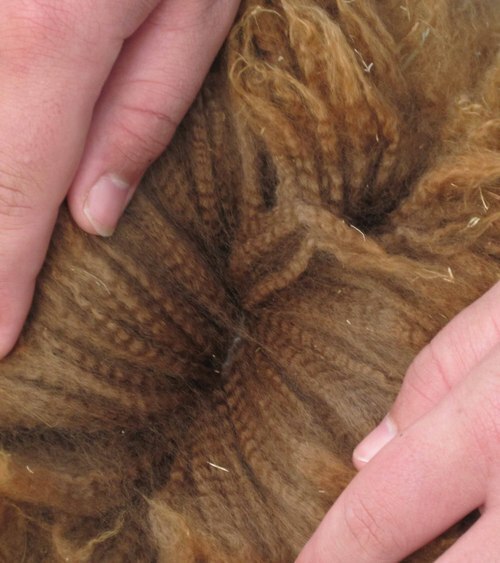 In this show he was competing in the Commercial Fleece Show against the "big guns" in the industry. He was second in scoring only to the Supreme Champion, a weanling (< less than 1 yr old) white Snowmass alpaca. What more can you ask of dark fawn fleece from a 29 month old alpaca male? The judge's comments were "Beautiful well organized character." This boy has got IT!! !